Welcome to RocketReviews.com (formerly EMRR). 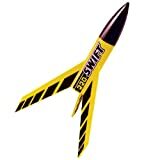 RocketReviews.com is the home of almost 5000 reviews of rocketry kits and products. Written by visitors to RocketReviews.com like you, the reviews cover everything from low-power model rocket kits to high-power rocket motors. The site's Flight Log allows you to record and share your rockets and their flights. The Builds feature helps you document your rocketry projects. At RocketReviews.com, you'll also find a large collection of rocketry resources such as a list of rocketry clubs, a calendar of rocketry events, and large libraries of OpenRocket design files and Rocksim design files. A number of rocketry tools and calculators are available to help you design, build, and fly your rockets. As you explore RocketReviews.com, you'll also find a number of fun things such as a huge library of rocketry videos and a collection of photo albums. The Double Helix is a great variation on the simple monocopter design from Art Applewhite. It is extremely simple to build and goes together quickly. It's also even more fun to fly than the Helix. I was lucky enough to get to watch the flights of the prototypes as Art was developing this line and now it seems like he is the source of a monocopter renaissance. It's a lot of fun. The components for this kit consist of a pre-marked body tube, 2 motor tubes, a 1/4" launch lug, 2 balance beams, and 2 basswood wings. 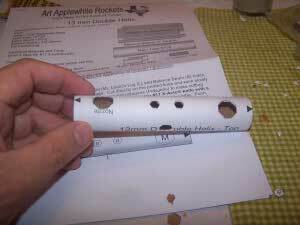 Also included are thorough instructions on building the rocket and instructions for a simple launching pad. This one is not meant for an Estes setup. The body tube, such as it is, is marked by the simple expedient of being wrapped by a sheet with all of the relevant locations indicated by polygons of the appropriate size. The first step in construction is to cut out the polygons on the body tube. This is done with an #11 X-Acto knife and the blade needs to be a new one. The method recommended in the instructions and, which worked quite well, is to push the blade in perpendicular along one line of a polygon, slowly push it in until the blade completely covers one line segment, remove the blade, and repeat as needed until all sides are cut out. After all the holes are cut out, the various pieces need to be test fitted into the BT. 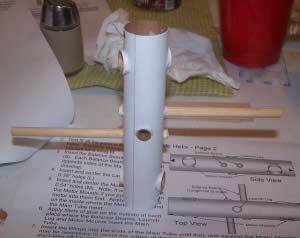 These include the launch lug, the motor tubes, and the balance beam. The wings wait until later. Pay attention to the instructions to get the balance beams oriented correctly. I built this one after doing a 13mm Helix and the balance beam in this case is not symmetrical. When the pieces are in, they need to be adjusted for symmetry; all of the pieces need to be centered. With that done, a fillet of white glue is applied inside the BT to the visible parts of the intersections with the motor tube. With that done, all of the protrusions can be filleted with white glue on the outside. The last items to be installed are the wing. These are made from a precut pieces of basswood. You can round the edges if you like but I did not. I slipped them into the marked ends of the BT. 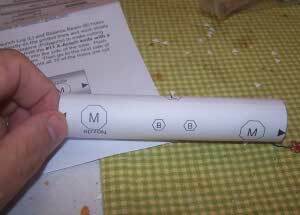 They will slightly deform the tube but that is expected and explained in the directions. Alignment is not a problem. A filled triangle marks the point on the BT which should be aligned with the center of each side of the wing. Then it is just a matter of making sure it is sitting perpendicular, something aided by having its end sit flush on the motor tube. The wing is then glued into place with white glue. Repeat for the other side. The instruction recommend a couple of light coats of sealer or a light coat of paint. I elected to go the paint route and chose red. I gave it just one good coat, the instruction warn against using too much and throwing off the balance. This was my first foray into monocopters (or bicopters). 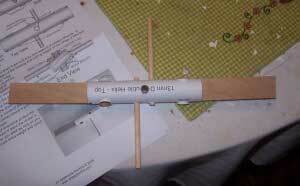 I used it at part of a demonstration for a kids event at the local museum and, as such, only got to launch it once. We had an extremely small launch area and I was prepared to consider myself lucky to retrieve any rocket. As such, I elected to use a pair of 1/2A3-2Ts. It didn't go all that high but it certainly got the kids attention. They loved it. I look forward to flying it in the future on A3-4s. This one is fun, easy, different, and an attention getter...especially from kids. 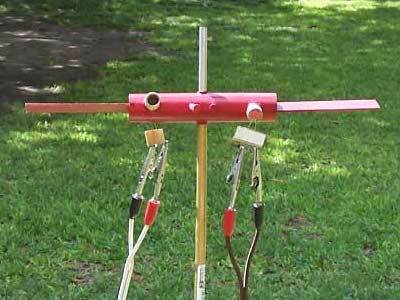 Browse our database of about 4,300 reviews of rocketry kits and other products. Visit the Rocketry Deals Finder to discover more specials.